Christine Hunefeldt is Professor of History and Director of the Center for Iberian and Latin American Studies at UC, San Diego. Her publications include, Paying the Price of Freedom (Berkeley: University of California Press, 1994); and A Brief History of Peru (rev. edn., 2004). Leon Zamasc is Professor of Sociology at the Sociology department and the Center for Latin American Studies at UC, San Diego. His publications include The Struggle for Indigenous Rights in Latin America with Nancy Postero (eds.) (2004), and Estructuras Agrarias y Movimientos Campesinos en America Latina, 1950–1990 with M. Chiriboga and E. Martinez (eds.) (1997). 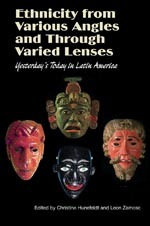 “The contributions included in this book were presented at the First Conference on Ethnicity, Race, and Indigenous Peoples in Latin America and the Caribbean, held in May 2008 under the auspices of the Center for Iberian and Latin American Studies of the University of California, San Diego and the Section on Ethnicity, Race, and Indigenous Peoples of the Latin American Studies Association. The papers explore, from different disciplinary perspectives, the position of indigenous peoples, afro-descendants and mestizos in Latin American social structures, and the social organization of these communities. Until the mid-twentieth century, these groups constituted the large majority of the rural and urban lower classes in many countries of the region. They were either excluded from the polity or included through clientelistic or corporatist mechanisms, be it in traditional conservative regimes or more modern populist ones. Culturally, these groups were excluded from the national community. With large-scale urbanization and industrialization, substantial segments of the indigenous, afro-descendant and mestizo populations entered the urban working class and the middle classes. With the expansion of education, some of their members joined the intelligentsia. Throughout the twentieth century, non-white populations participated in the processes of political mobilization that led to the constitution of modern mass-participation in Latin American polities, and the establishment of democratic regimes of varying levels of quality. Part and parcel of these processes was the re-definition of national identities, and the symbolic incorporation of indigenous, afro-descendant and mestizo groups into the national communities. The contributors discuss the dynamics of these groups’ collective identities. The massive economic, political, and cultural transformation of Latin America in the past century produced major changes in the way in which these populations understand themselves and are perceived by others. In particular, the generalization of education, the spread of the mass media, and most recently of the internet triggered processes of cultural re-definition in all sectors of society. Ethnicity is divided into three main sections, with editorial introductions to each part. Part One includes readings of the connections between ethnicity, nationality and memory, namely how indigenous groups today and in the past chose to represent themselves and their social environment, and how indigenous peoples have responded to state-imposed national and ethnic identities (“various angles”). Part Two engages with contributions that center around how ethnicity is construed through ritual, geography, and literary works (“various lenses”). Part Three sets out to explain how indigenous knowledge becomes commodified, reinvented, and re-appropriated from the “outside,” namely NGOs, pharmaceutical companies, and the state (“various angles”). This volume provides a rich and new reading of the several ways in which ethnicity has been perceived and represented by several historical actors, including indigenous peoples themselves, and how ethnicity, in the wake of such varied realities and perceptions, has been transformed over the course of time. It is essential reading for all Latin American Studies practitioners.